There is something very fundamental about the three dimensional space that we occupy as humans. I didn’t really start thinking that much about it until I had an amazing discussion with neuroscientist Sue Barry [author of Fixing My Gaze http://www.fixingmygaze.com ]. Her sudden ability at middle age to see in 3D was an emotionally charged event in her life. It was stereovision that, for the first time in her life, put her into an environment and made it possible for her to understand the relationships things have to one another. And to understand those things in a way that was not intellectual but fundamental — to be experienced just as touch and taste are experienced. Most of us intuitively understand space and dimensionality and take it for granted. We fundamentally “know” it exists – it is around us all of the time and we know it is there because we see it and experience it through our brain’s vision system. We see a ball coming toward us and can interpret the things that we need to do to catch that ball. And that ability comes to us in a way that we don’t even think about it. In an instant, we can determine the size of the ball, the texture of the ball, it’s inertia tells us about its density and weight and the force that it will likely hit us with. If we see it is a metal heavy ball coming at us at high speed we instantly know to duck and get out of the way because it would certainly hurt if it hit us. A balloon with little weight coming at us at the same speed merely takes a poke with a finger to bounce it in another direction. My point is that the ability to perceive space provides a rich database of information that goes deep beyond what we consciously realize. And I believe it goes even deeper than my illustration above demonstrates. Interpreting the space that we occupy tells us things about ourself that stirs the imagination and contemplation of our existance. That we can see ourselves occupying space and verify that through sound and touch and our other senses – that gives direction and purpose to our thoughts. Indeed, our intuitive understanding of space is so ingrained that when we see images without space we can infer the space that is missing within the flat image. Think about it! We have such a deeply rooted sense of how space exists around us that when we see a flat photograph we can use our mind’s eye to interpret it. Now, here’s the meat and potato part… When we look at a flat photograph, we interpret it. We don’t experience it. We can’t because it doesn’t depict spatial relationships. But add the depiction of space with a multi perspective image and there is a fundamental shift. The image can be experienced and a rush of information can be intuitively gleened from it that is exponential in nature as compared to imagery that can only be referentially interpreted. But… !!! If that depiction of space deviates from what we have experienced over the course of our lives, that experience can be extremely disruptive in tens of thousands of different ways. Yet, most only think of that disruption in terms of less than 1/2 dozen issues that we directly perceive and which manifest with some level of physical discomfort like a headache or nausea. That’s like looking at 6 leaves and describing the Sequoia National Park. As we start to create imagery that depicts space – when that depiction deviates from reality — that is a very big deal. Whether it is good or bad, I can’t say. All I can give opinion to is that it is exponentially more important than we think. When I take great care to match color, depth, resolution and size I notice that my photographs transition from being novel and a curiosity to look at – to an experience that is fundamental to being human. They become fascinating and engaging in a way that describes a real life experience. It is possible to experience empathy and even transferrence when looking at an AMPED 3D photograph that has high levels of resolution and accuracy. A claim that I don’t make lightly and one that I’m sure many will laugh off as mumbo jumbo. But my pictures are a window into the very essence of what reality is. That they represent a frozen moment of time makes them special in a way that is beyond description. Photography has always been an important tool to document something of historical significance. I submit that a photograph that accurately depicts space and reality takes us far beyond a referential interpretation to a place of experience and empathy. A true understanding that goes to the essence of being human. To quote Vice President Joe Biden: This is a big [expletive] deal! My AMPED 3D tattoo photography has fully captured my imagination and I can’t wait for all of you to see my exhibition and experience what I am experiencing! My discoveries have exceeded my expectations to such a degree that I have now found my life’s work and see its importance in ways very unexpected. One can indeed learn much by looking closely at moments of time and space. With AMPED 3D photography there is the chance to witness the diversity of emotion and being — to increase our understanding of what it is to be human. When viewed lifesize, a different perspective for each eye… you see something magical that is hard to describe. That’s an AMPED 3D photograph and it just doesn’t come across on a computer monitor, sadly. NYC Tattoo Convention – Thanks Steve Bonge! Oops! In my last blog post I neglected to thank Steve Bonge – without him there would be no show. He is indeed a New York icon, and rest assured the NYC Tattoo convention is a very big and important event on many levels. Thanks! What is especially gratifying to me is that people of all backgrounds, professions, cultures, socioeconomic status… etc. can all find common ground appreciating tattoos and in turn appreciating what AMPED 3D photography is all about. With AMPED 3D photography, I am capturing and presenting tattoos in a way that is only surpassed by seeing the ink in person. One minute, I am enjoying the company and conversation with a doctor in a business suit and the next minute I’m having an amazing conversation with a full bearded activist. Art cuts through and communicates like nothing else. It has tremendous power to change minds and inspire. Great art is a type of truth that rises above everything else. That I have the opportunity to participate is humbling. It is a privilege to see and photograph such diverse and amazing tattoos. That I am permitted to exhibit AMPED 3D work to a large audience at the NYC Tattoo convention is not something I’m taking for granted. It is VERY special! AMPED 3D Exhibition At Largest NYC Tattoo Show! The trip I took to meet with Clayton Patterson in New York paid off. He is a fascinating person with a lot of history in the New York tattoo world. I wasn’t sure if he would be impressed with my AMPED 3D photography. But as we stood there in his gallery on the lower east side of Manhattan and he stared and stared at my photograph, I knew it resonated with him. He was very generous with his time and provided a lot of commentary. A couple of days later, he emailed me with the news that I could exhibit 18 of my images at the 15th annual New York Tattoo convention http://www.nyctattooconvention.com May 18, 19 and 20th. With Wes Wood (Unimax/Sacred) and Clayton Patterson seemingly impressed along with now so many others, I am feeling much more confident that my efforts to create art depicting tattoo art will resonate with a large audience. As I mentioned in my last blog post, my imagination is completely captured with ways to depict an ink master’s work with my AMPED 3D photography. It seems possible that it using a myriad of colors and even UV florescent tattoo inks. I find that particularly gratifying and I am fascinated by the skills of truly amazing artizans. As I look at some of the images I have put together, I find them so compelling that it is difficult to take my eyes off of them. If you are going to be in New York in May, you simply must come and look at the AMPED 3D exhibition. It is free with your paid admission to the NYC tattoo convention. I’m not sure exactly where I will be, perhaps in the basement of Roseland, but please seek me out! You won’t be sorry. If you are there to get a tattoo, it is a chance to check out some great examples prior to picking your artist. And there are going to be some incredible artists at the convention. I hope that I can meet and speak with every one of them to hear and learn how I can improve upon my first exhibition! Of course, there are many many others to thank including Medway’s own Canman and Easthampton’s Gabe Ripley. Dan Brown at Skin&Ink magazine and dozens of volunteers who let me experiment taking test photographs of their tattoos. All of the artists! You are amazing! Lalo Yunda – your work is inspiring. This is very special and I will be talking about all of the participating artists in future posts. 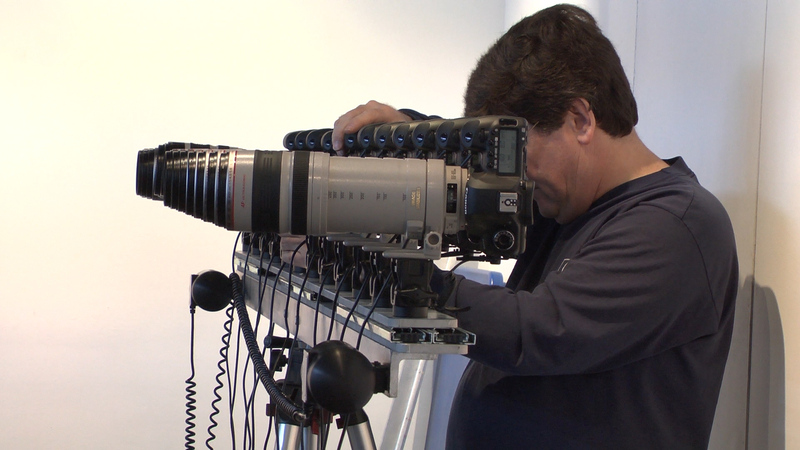 Please come to the show and check out the AMPED 3D photographs! AMPED 3D Tattoo Exhibitions You Have to See! 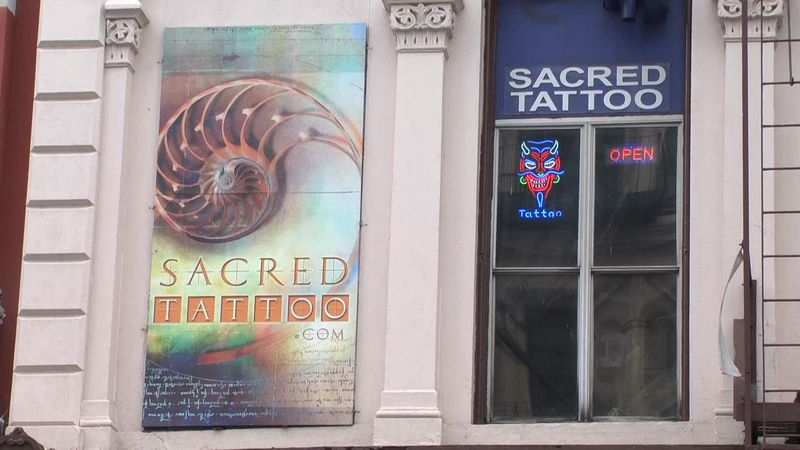 Sunday, March 4, I had an extraordinary experience at Sacred in New York City. People with amazing tattoos came, thanks to the coaxing of ink artists, for me to photograph with my camera array. Then there was an epiphany. I realized that all of my work to perfect a high resolution camera array that could capture over two dozen perspectives — and a way to process those perspectives — writing the software and working with manufacturers to develop a precise lens material to laminate to the print — all of the exhausting, frustrating work… it was worth it! You probably don’t think that looking at an amazing tattoo in real life is that big of an experience. But you would have changed your mind if you were there with me on Sunday. The internet, TV, magazines and other two dimensional media simply don’t represent the reality of ink art. Indeed, overdone photoshopping of images give them a fake look that has little in common with reality. I’m sure the publicity is appreciated by the ink artists, but a magazine’s synthetic over sharpened color boosted images are a misrepresentation of the artist’s work. Not to mention, they are printed on flat pieces of paper. A tattoo is anything but flat. The space that it occupies defines it in a way that is unique and personal. The canvas of human skin is special in a myriad of ways. As with all mythology, there are some elements of truth to the stories associated with tattoos providing special powers to those that have them. When you look at a life size AMPED 3D photograph and experience the subtleties, texture and space occupied by the ink and skin canvas, you discover something special and unexpected. It’s impossible to explain, but you know it when you experience it. Personally, you’ll find it difficult to look away because there is so much to look at. With each subtle shift of your eyes and head you see something slightly different. With each look, a story unfolds in hundreds of ways. So, you might get the impression that I am passionate about AMPED 3D photographs of tattoos. That impression would be spot on. I’ve put aside every other project and am focusing my efforts exclusively to locating the best of the best tattoos from around the world to personally master to AMPED 3D photographs for exhibition. With each image there is a special quality about the art that speaks to what we are as human beings. Our skin is what we present to the world to tell our story. When we alter our skin, there is a significance to that which goes beyond language and other forms of communication. Who we are changes with the application of a tattoo. How that change manifests is fascinating and insightful. It is humanity coexisting within art. Some people are dismissive of ritual and mythology. They scoff at the idea of a tattoo holding any special significance. But when time is taken to observe and experience tattoos in person – or available to experience as an AMPED 3D exhibition – something gets revealed in a way that our ancestors understood, that we might also understand if we take the time to observe. Perhaps you will roll your eyes and think I’ve gone off my nut, but I can honestly say that there is something to be revealed about humanity when looking at tattoos – something new, insightful and important. That is what the AMPED 3D Exhibition is all about. The best of the best tattoos, revealed as they appear in real life but possible to examine as art, collectively at a single location where time stands still and thoughtful contemplation can occur. But to enjoy an AMPED 3D exhibition, you don’t have to be as emotionally invested as I am. You might simply want to go to see the current state of the art or to get an idea for your own tattoo. Maybe you’re interested in a point of reference as to how various artists compare or to compare your own ink to that touted as “the best of the best”. Speaking of that, what do I mean by “the best of the best”? That is an evolving target that links to building relationships with conventions and competitions. 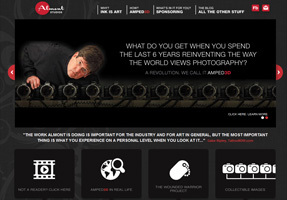 Each AMPED 3D photograph is carefully documented with the reasons why it is being included in the exhibition. As the exhibitions grow, it will be more difficult to decide which pieces don’t make the cut.